The competition space should utilize a sand-filled circular ring in principle, but indoor competitions may substitute mats instead. For competitions using sand, the height of the sand in the competition ring must be between 30-70cm and the diameter of the ring shall be 8m including the bordering edge. There must be a 1.5m border of additional space at the exterior of the ring in order to help prevent player injuries. The difference in heights between the competition ring and the additional space must be 10-20cm. 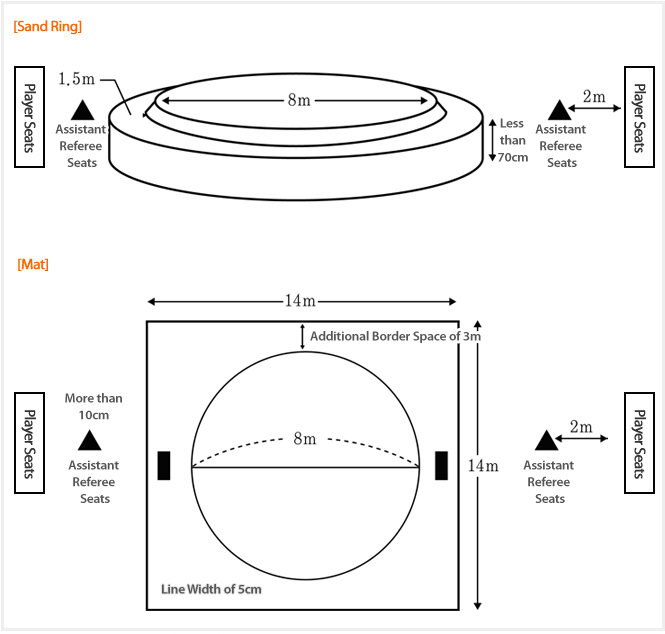 For competitions using mats, the diameter of the competition ring must be 8m with a 5cm border and 3m of additional width outside the ring; ring and border heights must be in same plane when using mats. The belt-and-thigh-band(satba) for student class players 15 years or older, as well as adult class players must have a total width of 114cm of blue or red 16mesh cotton cloth. The remainder of satba(belt) length after fastening must be less than 30cm. All satbas(belts) must be certified by the WSF. A. Players shall wear uniforms certified by their main regional office. All uniforms must allocate a 10cm wide white strip (5cm on either side of the lateral seam) on both sides of the garment for bearing the player's name. Uniforms may have sponsorship logos attached to the back. All players must wear the standard blue or red satba(belt) as described in Section 3 during competition. Players not in proper attire will not be allowed to compete. A. Female players must wear a sleeveless leotard top and trousers as certified by the WSF; uniforms must be interchangeably red and blue as needed for competition. B. Female players must be interchangeably red and blue as needed for competition. C. Female players may restrain their hair using flexible hair ties(e.g.rubber, nylon, ribbon); hard plastic or metal hair restraints are prohibited. Likewise, females players may not wear any ornaments (e.g. rings, earrings, wrist bands, necklaces). D. The short sleeve T shirt or the tight jacket to the body and the trouser of uniforms shall be worn at the weighting with bare feet.